Alison Caldwell: Welcome to the first Next Gen Tech Fund Podcast. I'm Alison Caldwell and I work for the Defence Science and Technology Group, or DST. The Next Generation Technologies Fund is storming into its second year, focusing on fundamental research and development of future game changing concepts for Defence. To date, more than 130 million dollars has been invested in collaboration with partners representing universities around the country, small to medium sized businesses, publicly funded research agencies and defence industry primes. 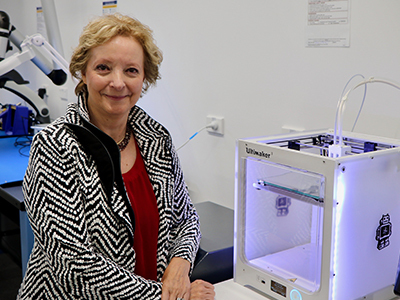 Chief of DST's Science Strategy and Program Division, Dr Janis Cocking is the Program Lead of the Next Generation Technologies Fund. Janis Cocking: I think what's really good about the Next Generation Technologies Fund is that the Government through the funding has enabled Defence to provide a greater number of universities and industry with the ability to do research that could have a really big impact on Defence capability in the future. Alison Caldwell: Would you say DST as a result of this has been tapping into these previously undiscovered pockets of technological skill and excellence? Janis Cocking: I think the early indications are that's true and so an example of that is when we went out for the call for the Fight Recorder so there are companies there that hadn't been involved with Defence in the past same with the Grand Challenge Program companies that hadn't been involved with Defence in the past but one of the other benefits that we've found again early indications is that we've been able to put together companies that maybe didn't know each other and by putting them together they can perhaps create a system or a sub system, for defence, that by themselves they wouldn't have been able to do and again I think the Fight Recorder is a good example of that with a small company in South Australia another small company in New Zealand didn't know each other but now they are working together. Alison Caldwell: And we probably didn't know them either. Janis Cocking: No not at all if it hadn't been for this program we would never have discovered that. Alison Caldwell: With some of the programs so far we've issued calls for applications most recently it was the Quantum Technologies program, how are we helping to build communities in areas that are pretty small still in Australia? Janis Cocking: Well I think we've got quite a depth of talent in quantum technologies there's possible applications for Defence in things like navigation and timing using quantum technologies, advanced communications systems really broad applications and by harnessing the different communities across Australia in a coordinated research program that's strategically focussed we think that sooner rather than later we'll be able to have this impact demonstrated. Alison Caldwell: Is this changing DST? Janis Cocking: I think it is in one sense because now while we might have dreamed in the past of being able to collaborate more widely having this fund has enable us to enact that you know really realise the dreams and before we never would have been able to stand up something like the Grand Challenge program because it's a large amount of money it's a really challenging problem, it's really multidisciplinary in its approach but by being able to make use of this fund we've got researchers from across the whole of DST involved, we've got universities involved and both large and small industry involved. Alison Caldwell: What have you learnt about Australia's scientific community from this process over the past year. Janis Cocking: I think that the depth of talent is really immense I think that there's a real interest in being able to make a difference and so it's not only defence scientists who want to make a difference it's other people who want to make a difference and I think that there's a real potential for very exciting careers in science and technology associated with defence and defence industry. Alison Caldwell: What sort of feedback have you received from defence, from our major customer? Janis Cocking: They're really excited too so we're looking at expanding programs we'll have a new Grand Challenge and so, we'll run a competition for that because there's been so much interest on the various ideas that might make up a new Grand Challenge so we'll need to run a competition on what one will be chosen next. I think with the Defence Cooperative Research Centre slightly different way of adaptation of the really successful CRC program mission driven so top down again but we'll have another Defence CRC in a couple of years from now so choosing what that might be again is really good potential but I think it's excited a lot inside defence on what might the topic be for both of those programs. Alison Caldwell: You say DST will run a competition for the next Grand Challenge, how do you mean a competition? Janis Cocking: What we're trying to do is be really transparent in making the choices because it's not a magic pudding there's a set amount of money so we need to have the sponsorship and the endorsement of what the choice might be for the Grand Challenge and so we want to run a process that's transparent to all so that the criteria and the choices are quite clear so we can stack up all the various options and then make the decision. Alison Caldwell: And when will that happen? Janis Cocking: Middle of the year and absolutely happen by the end of the calendar year. Alison Caldwell: And when you say a sponsor do you mean in Defence? Janis Cocking: Yes yes so it needs to be someone in Defence or one of the services within Defence who are really interested in this, really broad and complex problem, big challenge, high risk, but if it pays off it has great results. Alison Caldwell: The collaboration vehicles as we call them, Grand Challenge, Defence CRC, SBIRD do you think we've got them about right? Janis Cocking: I think so, I think there's a range of size, a range of complexity associated with them, every single one of them is based on something that's been successful overseas so we're starting from a foundation where we have a degree of confidence that they'll pay off but time will tell. Alison Caldwell: This is an organisation which has always embraced failure. Janis Cocking: I think it's really good if we don't fail, we haven't tried something that's risky enough and you always learn a lot from mistakes and if fact what we might be doing for something that's failed is saving money in the long term because we're not investing or continuing to invest in something that doesn't really have military utlity. Alison Caldwell: That was Janis Cocking, the Program Lead of the Next Generation Technologies Fund. I'm Alison Caldwell. We'll have another Next Gen Tech Fund podcast for you to listen to soon, so keep checking on @DefenceScience on Twitter, LinkedIn, Google Play or Apple iTunes. Thanks for listening.